Every single one of the most popular web applications in the world today was once a fledgling startup. Without product and engineering teams composed of hundreds or thousands of people, the founders of these companies had to find ways to build amazing products with a minimal budget. Pop culture now regards many of these creators as technical geniuses, so you might expect their early products to reveal their incredible talents. All of these incredible teams had one thing in common: they built a product that users absolutely craved. They were able to help their early adopters so much that the users were willing to look past their questionable design decisions. These examples will reveal the shoddy design decisions you can get away with if you focus on building a product that users love. Note: If you want to check out the day-by-day history of any website, check out the Wayback Machine! It has screenshots of every change that a site has made since its inception. 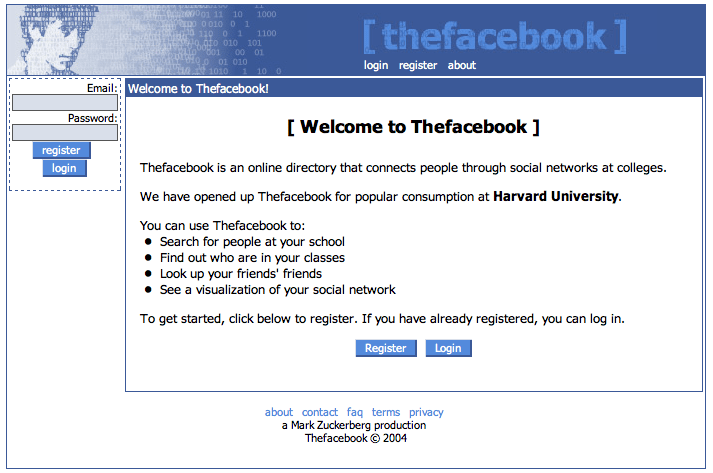 This is a snapshot of Facebook (Thefacebook, at the time) from 2004 when it was only available to Harvard University. The design calls for many questions. Whose head is on the top bar? What does “popular consumption” mean in the second line of the main section? Why are there brackets in the title? Regardless, Facebook was a revolutionary way to connect at that time and included some key product decisions that could separate it from Myspace and Friendster. The intimate focus on the Harvard community helped create an active user base. Mark Zuckerberg and his team worried about solving one problem for one community and did not scale until they succeeded. Facebook was capturing real human interests in an online social network, and that helped users push past early design flaws. This is Buzzfeed from 2006. You will notice that their model seems to be fundamentally different than it is today. They seem to be aggregating content from other providers related to popular news topics while their model today focuses on producing content with clickbait-style headlines. While this actually does a little better in the design principles category, it is pretty generic and could be for almost any content-oriented website. There is nothing to give you a clue about what you will consistently find on the site. This could easily be some random blog. The info box at the top right even declares that the content is “worth your time”. You cannot convince a user of that fact by stating it… you have to provide actual beneficial content! Contrast this with the current Buzzfeed main page. The current main page does an excellent job of capturing the emotions that it wants users to feel, like surprise, disgust or humor. The old Buzzfeed site is dry and emotionless, which is the opposite of the main value proposition of the company! In 2006, this one stop shop for popular and viral content was still a relatively open space, and Buzzfeed was able to provide enough valuable content to keep users coming back. Once they created a site that would help these early adopters, they had the time and money to bring on more talent and prepare their site for a larger audience. 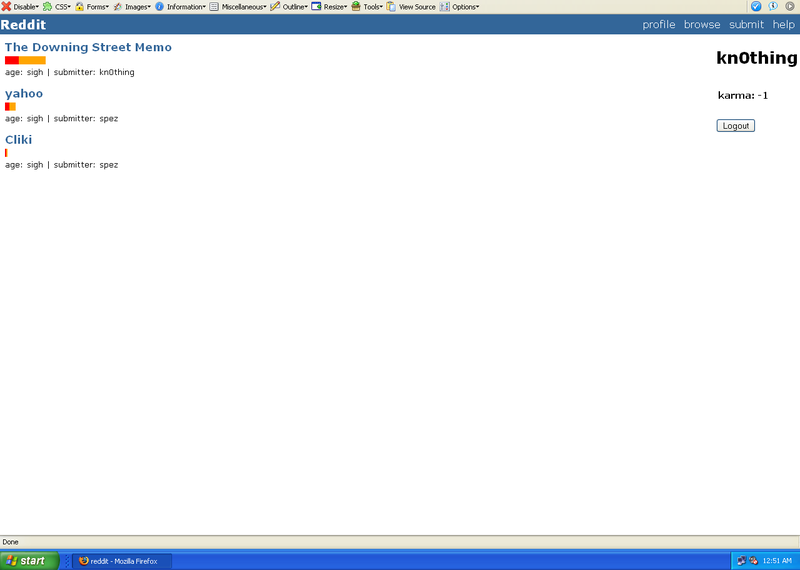 Reddit initially launched to the public with this interface in 2005. The exceptionally minimalistic approach provides almost nothing to criticize… because there are so few features! There is no concept of subreddits or comments, two incredibly useful features of the current site. In fact, you can only really do three things with this version: upvote/downvote, click links and submit links. Any developer could build this site! Keep in mind, there was already a 500-pound gorilla that was succeeding in this space: Digg! They had money and a large user base. But, Reddit was able to outline one way to beat them- a rich community that defined the site. It focused on community-building, which slowly attracted Digg’s users. Reddit had a consistent stream of interesting links, and early Reddit users could look past the minimal feature set because they could easily browse all the interesting content. Remember that when Uber launched in 2010, smartphones were not nearly as common in the United States. Since many users would need to hail their on-demand cabs via SMS/text, Uber needed to find a way to visually explain how their product was superior to cabs. They built a web interface to accomplish this. 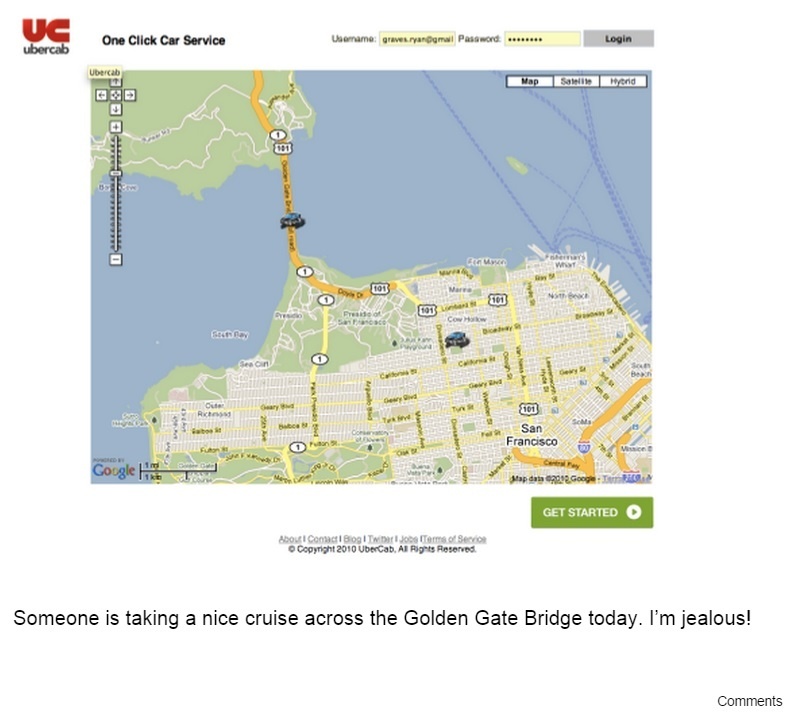 Compare this to the current Uber experience- instead of using an app to find the distance to the nearest car and then instantly ordering, you had to use a much less obvious text interface, and use a computer to check for real-time updates. But it was good enough. Uber was able to survive and grow with their limited SMS and website combination. By the time smartphones became popular, Uber was well-funded and ready to capitalize. My goodness, look at that green sidebar! It appears to be a tactic to draw the user’s eye to the sign-up section. Interesting approach. Also, check out all the Tweet examples that they offer. All are pretty straightforward and focused on sharing little life details. Today’s version of Twitter is used for all sorts of things, but it is rarely used for little life observations. It is more often used for news, sarcastic remarks or provocative statements. Nevertheless, Twitter famously exploded in popularity after the 2007 South by Southwest festival. The microblogging tool offered a casual, informal way to read about news and share personal anecdotes. This was a unique offering, and early adopters were not going to let a strange-looking green sidebar stop them from joining. 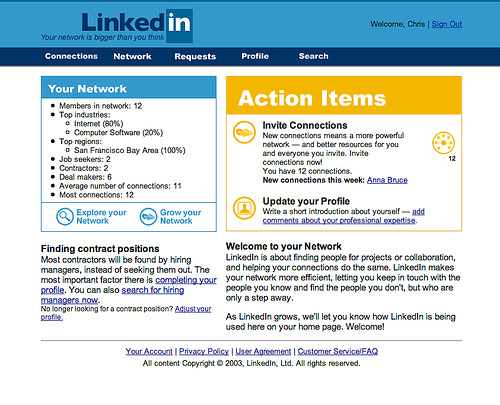 LinkedIn is a little older than the other sites since it was started with the first big wave of web companies in the early 2000s. This is a user’s personal page, rather than the other examples which were usually landing pages. Compare this version to the helpful visual features and infinitely scrolling newsfeed in today’s version. The big orange box encourages users to invite connections and update the profile. That is crazy! Users are not visiting LinkedIn to update their profile or invite others, they are doing it to stay in touch with their professional network. The designers decided to dedicate a large portion of the screen to these secondary concerns. Also, you will notice that there is actually nothing immediately valuable on this page. Everything is at least one click away! Today’s LinkedIn has a stream of updates and potentially interesting stories that are immediately available. Stories are broken up by individual members so you can get instant notifications on the movers and shakers in your network. Certainly, creating a well-designed website is important, but it is secondary to building a product that helps users accomplish their goals. When you are trying to gain a user base for your product, you do not need to worry about making the site perfect for all potential users. You just need to find a way to make the early adopters happy. They will be willing to look past some design flaws if they truly value the product. This is great news for you as a product creator- don’t be afraid to launch early and start getting feedback! This post was written by Kevin Kononenko, the founder of Manual, a site where developers have been voting on the most helpful coding and design tutorials on the planet. He is also a self-taught web developer. You can check him out on Twitter, Quora, and Medium.